Medium (18-24 Mos) - $29.99 Only 4 left! Large (2T-4T) - $29.99 Only 6 left! When your little one was super little you could say anything around them. Really, they couldn't talk yet so they wouldn't repeat any of the words that you had been saying. Then the day happened. You were putting together some Ikea furniture and let a couple less-family-friendly words fly. Next thing you know your little one is giving a couple of those words a try. Well, at least it's a little cuter coming from your little parrot! If you're putting together a pirate crew for your next costumed event then there isn't a character out there that's better than this adorable parrot. Your little one might be a repeater but their words are still adorably innocent! So, when your kiddo sings out "Sixteen men on a dead man's chest" you know that's not a true blue bad guy spirit deep down inside. Hey, you can teach this little parrot anything but "Aye, aye sir" is a lot more adorable than your every day "please" and "thank you". There's plenty of time for niceties later on! This parrot costume is sure to make the other birds jealous of all this color. It's soft with a fleecy feel and bubble-shaped bottom. 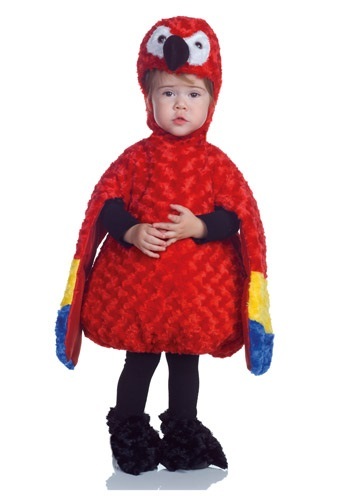 The wings hand over your child's arms and have blue and yellow accents. The hood sweeps over their head for a cozy feel. The parrot has a white mask and a sculpted beak. Take your kiddo to the zoo or better yet the cracker barrel! Just. . . be careful what you say. This is the cutest little outfit! It's well made & fits my 2 year old great! He loves it too! That is a very cute outfit! Great taste, and I'm sure it looks adorable on your 2 year old. Have a fun Halloween!